Two separate arcing insulators temporarily shut down service on two portions of Metro's busiest line during rush hour Friday morning. 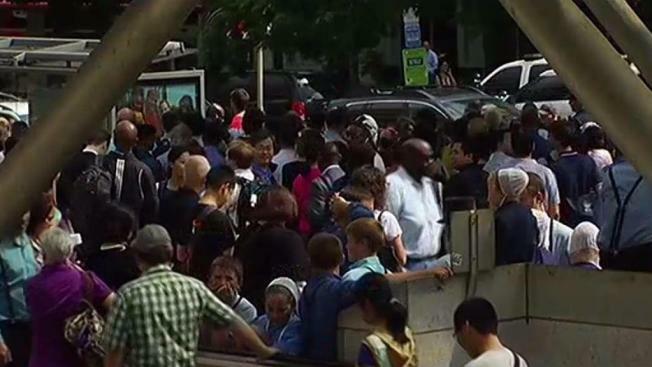 Red Line service was temporarily suspended between the Dupont Circle and Van Ness stations for about an hour. Service later was restored. Earlier Friday morning, service also was briefly suspended between the Medical Center and Grosvernor stations. A short time later, Metro announced that trains were single-tracking. Service on that portion of the Red Line also was restored, but many riders experienced major delays. "This is ridiculous. I ride the train from Shady Grove every day. Every week, there's a problem with Metro," rider Fatema Dariani said. "This is not acceptable." Metro said arcing insulators were responsible for both service disruptions. Both incidents were likely the result of water coming into the tunnels during the heavy rain Friday morning, Metro explained on Twitter. An arcing insulator happens when "an insulator along the third rail that may be giving off sparks or smoke," according to Metro's website. Metro later apologized for the "especially difficult morning." Just when I thought the MTA was bad, DC metro shuts down the most central line w/o warning during rush hr. WYD?! I have a soft spot for #wmata. I just want it to do better and not catch on fire.